Salmon is always something you can turn to for any occasion. It can be a very elaborate dish for a dinner with guests or an every day meal. It´s easy to find fresh salmon in the supermarket but you can also buy the frozen kind and keep it in the freezer for a long period of time and have it ready to go when needed. 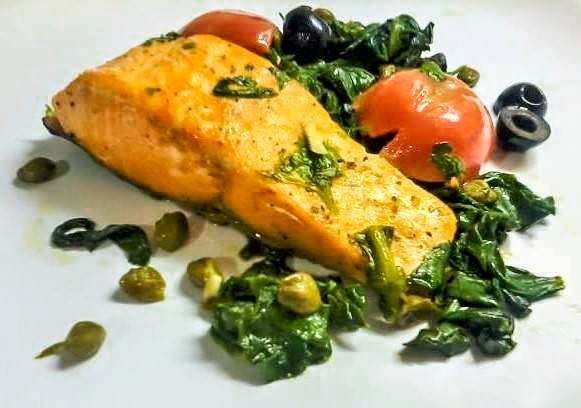 Of course, fresh salmon is is always best like the one in the recipe below. 1. Heat oven to broil. Coat base of baking tray with 2 tablespoons of extra virgin olive oil. 2. Place salmon fillets, flesh side up on baking tray and drizzle a little more oil over the top of each salmon fillet. Season with a little salt and ground black pepper and cook without turning, until salmon is cooked through, usually 8-10 minutes. 3. Meanwhile, heat oil in large saucepan over medium heat. Add onion and garlic and cook, stirring gently until softened. Stir in the plum tomatoes, spinach, capers and olives and cook for a further two minutes. Remove pan from heat. 4. Remove salmon fillets from oven and transfer to 4 serving plates. Spoon tomatoes mixture over the salmon and serve.